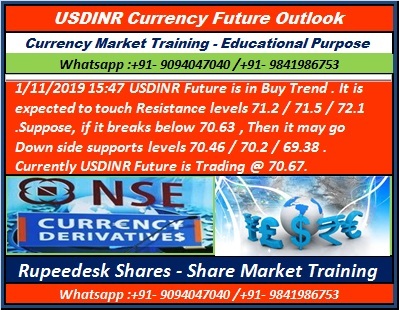 1/11/2019 15:47 USDINR Future is in Buy Trend . It is expected to touch Resistance levels 71.2 / 71.5 / 72.1 .Suppose, if it breaks below 70.63 , Then it may go Down side supports levels 70.46 / 70.2 / 69.38 . Currently USDINR Future is Trading @ 70.67.